The whole Tanbark team was amazing. I will definitely refer anyone who asks about the Personal Care Ortho Respite stay apartments. The building is beautiful, my apartment was lovely, and the care was superior. Choosing to go respite, instead of straight home from surgery was the right decision, and I feel further prepared to be at home now. 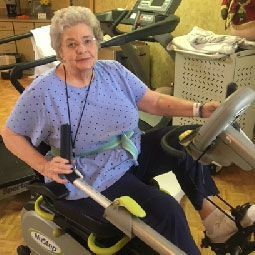 At Signature HealthCARE at Tanbark Rehab & Wellness Center’s Personal Care Ortho Respite Apartments, Barbara joined the Signature family to help build her strength. With both outpatient physical and occupational therapy services from the Tanbark therapy team, as well as daily care from the nurses and CNA’s, Barbara is returning home again. Congratulations Barbara and thank you for choosing Signature HealthCARE at Tanbark!